I have a new home! And way ahead of schedule. I thought it would take a few weeks to find a good place, but it seems luck was on my side. After seeing a LOT of really old, crappy, horrible, dank, dark, nasty looking places, I walked, on a whim, in to an agent’s office, who just happened to have a nice place to show us. When house hunting, I think you should trust your first instinct when you walk in the door. If you immediately think, “Eww, gross, no,” then there is no way. If you think, “Oh! Well this is nice!” then you should jump on it. Your first impression is in my opinion usually the right one. So would you like a sneak peek in to my new home? It’s a 2 bedroom, fully newly renovated, with an open kitchen, and the absolute BEST PART is the private roof top. A little piece of space and fresh air up in the sky! 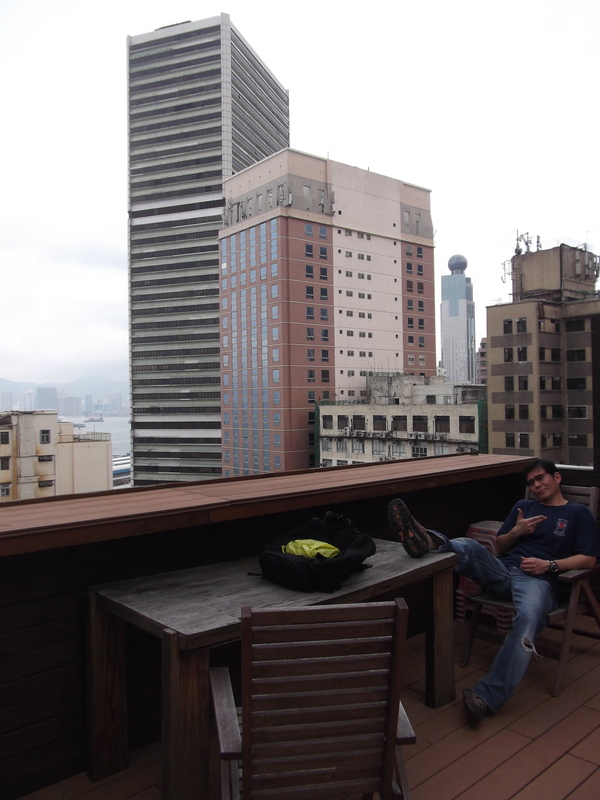 I have always longed for a roof top in Hong Kong as they come at a premium and are in low supply. I think we were extremely lucky to stumble upon this place. Already liming on the roof, enjoying the spring weather. Not sure why he is flashing some gang signs. Maybe there is some yakuza in the area that we don't know about. 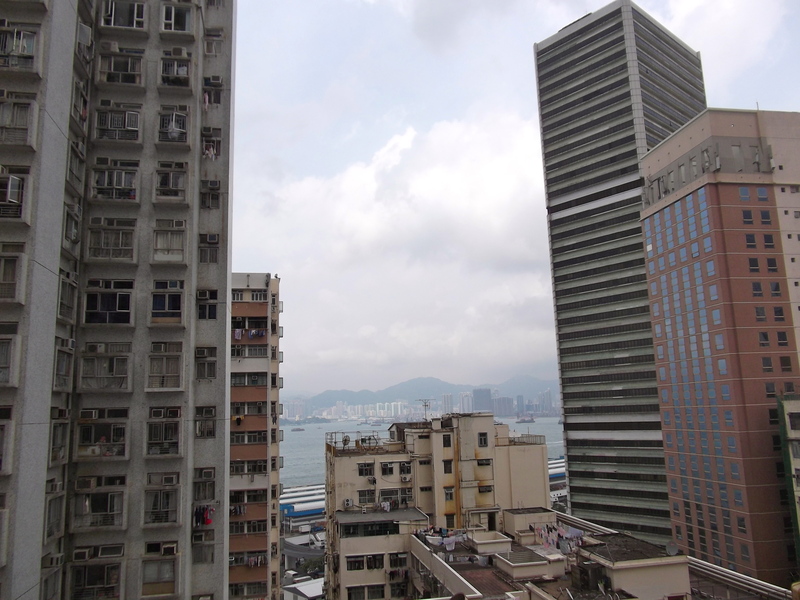 Even have a little peek of Victoria Harbour! New kitchen -- you would not want to see an old style horrible kitchen! 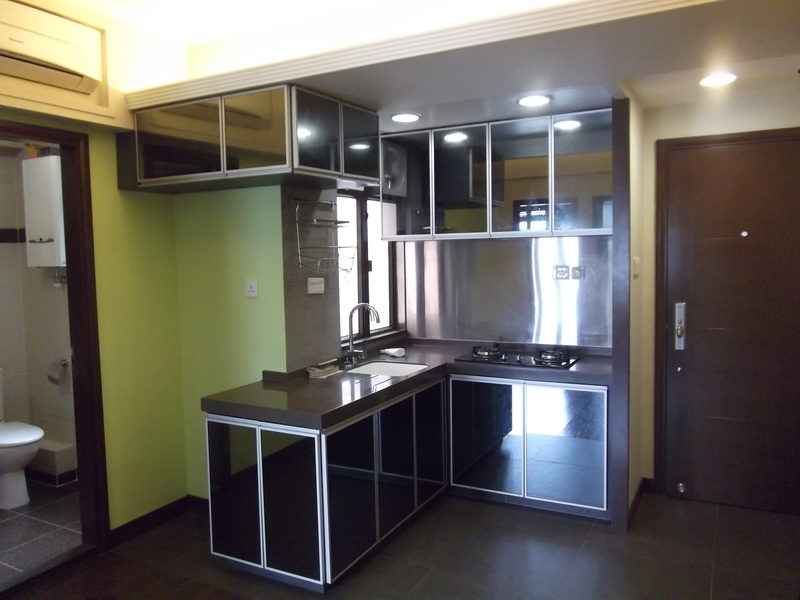 I have to say, this house hunting experience on Hong Kong island has been incredibly eye opening. I don’t think I ever really understood what a struggle life can be in Hong Kong for the majority of the population. For example, we saw one place that was 800 square feet with three bedrooms. However, they had converted the place into a flat that could potentially rent out to three different people, with each paying TT $5000 per bedroom! My dear Uncle Geoffrey always used to shake his head and say, “Boy, I doh know how poor people does do it.” The same applies to Hong Kong. In comparison, myself and my husband are very fortunate to have 600 square feet, and two bedrooms, all to ourselves. We have the ‘luxury’ of turning one room into an office. Many families in Hong Kong all live together with extended family members, grannies and grandpas and uncles and aunties and babies, all in a 2 or 3 bedroom flat. Could you imagine? Anyway, I am very grateful to have a nice, clean, renovated new place, and the roof top is just the cherry on top. I think living downtown is going to be a hell of a lot of fun…. I would think, “Fete foh so” on that roof top! Terry. So glad you two found something that you will be comfortable in, and a place to escape to. Cool looking guy there you have. Looks like he has definitely settle in. An office for fly tying?….Being downtown sounds like you’ll be close to good food and shopping? Do apartments like that have washers and dryers for you to use, or do you have a Cleaner’s close by?